The Innoveyor InnoFlex Self-aligning bearing housing technology is engineered with 4 independent seal zones which protect the bearing from the ingress of solids and liquids. Zone 3 is the top and bottom Grease Retention Seals. and the Zone 4 is the two Rubber Contact Bearings Seals located between the bearing races. Each zone works independently,slowing and moving solids and liquids away from the bearing; allowing the bearing to run smoother and increase production. 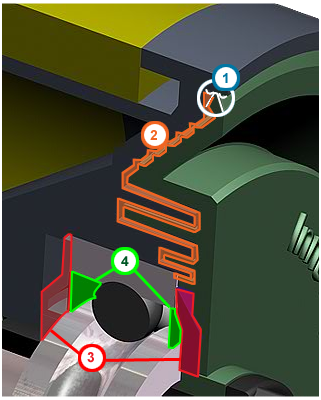 In Zone 1, the circumference of the non-rotating flinger; its outer edge, and the body of the InnoFlex bearing housing make up the primary seal zone. This is the first line of defense in stopping solids and liquids from entering the housing during the toughest application; when the conveyor is sitting idle and the rolls are not turning. creating centrifugal and mechanical forces which fling the particles away from the bearing housing and actually helping to block other particles from entering deeper into the bearing housing. Zone 3, prevents bearing grease escaping from the InnoFlex bearing housings; preventing rust and corrosions. Zone 4, encloses the bearing and provides the last lines of defense.